I have large blue optics with lighter spots for the pupils. Be sure to make me a athermatron. 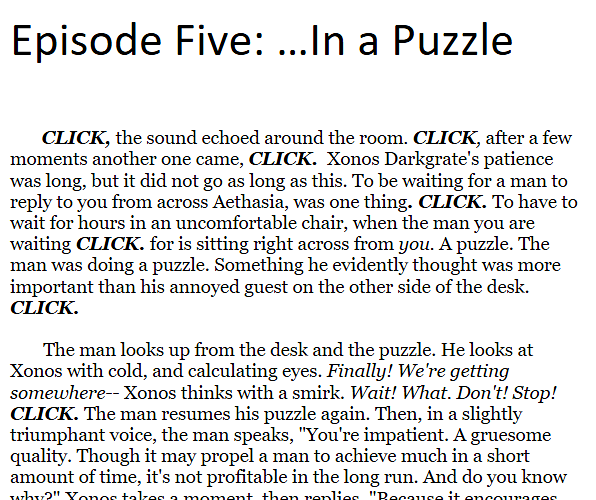 @Xonos_Darkgrate1, can you give us an estimate of when episode five will come out? It must be really good if we had to wait this long! Yeah, it goes longer than my expectations and wants. I'm working on it at this very moment. I'm trying as hard as I can! This has been a busy day!!! Don't sweat it! I can wait! You can't rush greatness. 15 posts were merged into an existing topic: Random anything Bwah hah hah. Episode 5 is REALLY long! I think it will be done by tomorrow, but I'm still writing so maybe I can finish before 9:00 C.T. Okay, here's another sneak peak of Episode 5 to keep you guys' hopes up!!! OH MAN OH MAN OH MAN!!! SO EXCITED AHHHHHHHHHHHHHHHH !!!!! I honestly wished you wouldn't have posted that because now I'm gonna be DOUBLY WAITING THE ARRIVAL!!!! Let's hope he sees your post before I release the episode then. But actually, Aetherlight: Origins is some time before now. So this has already happened to him. @Xonos_Darkgrate1 WOW!!!! That was only the exerpt and I love it already!!!! I can't wait to see what the WHOLE thing is!!!! HEY!!! EPISODE 5 IS OUT!!!!!!! COME AND READ IT HERE!!! !